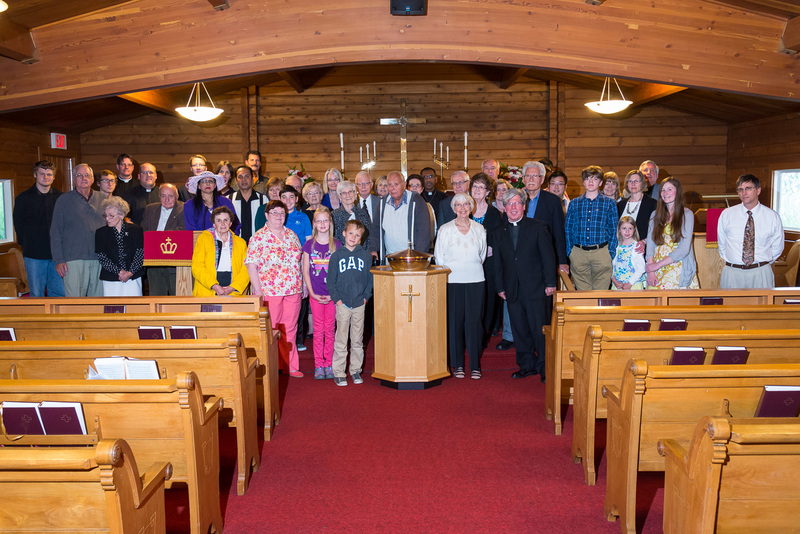 Trinity Lutheran Church, Niagara-on-the-Lake, celebrated her 60th anniversary on Sunday, 28 June, with the theme, “The Gifts Christ Freely Gives”. The celebration began with organist Michael Nieminen giving a recital of Reformation-era chorales that touch upon the Christian prayer life. These chorales continue to serve as a source of comfort and instruction through their inclusion in Lutheran Service Book. “To God the Holy Spirit Let Us Pray” (Nun bitten wir den Heiligen Geist, LSB 768), “Come, Holy Ghost, Creator Blest” (Komm, Gott Schöpfer, Heiliger Geist, LSB 498), and “Lord Jesus Christ, Be Present Now” (Herr Jesu Christ, dich zu uns wend, LSB 902) are just three of the many chorales that to this day are the mainstay of congregational singing in our Lutheran churches. The anniversary celebration continued with a catered rotisserie chicken dinner. While everyone was enjoying the apple pie, greetings were given by District President Paul Zabel, Seminary President Thomas Winger, and District Gift Coordinator Alfred Feth. 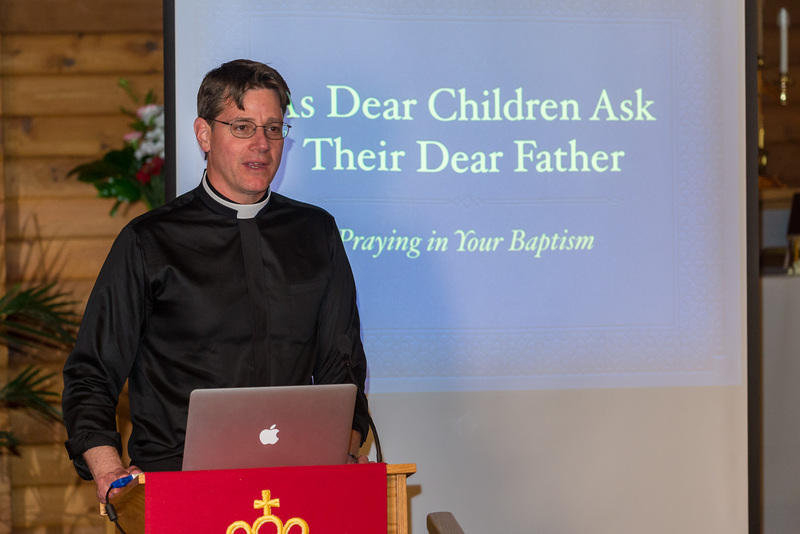 Following dinner, Pastor Kurt Reinhardt gave a presentation on prayer. He spoke of how we often attempt to pray in the way of the Law, as if we had to twist God’s arm to get what we want. However, our calling in Christ is to pray in the way of the Gospel, trusting that our heavenly Father is good and gracious, and relying on the gifts of Word and Sacrament. The evening concluded with Vespers. Pastor Larry Ritter preached about the two ways of treating forgiveness—forgiveness as achieved by Christ on the cross on Good Friday and forgiveness as distributed to us today. Forgiveness comes to us in specific ways. Forgiveness is not in the air we breathe, nor does it come to us through a beautiful sunset or because we think we are too nice not to be forgiven. Rather, God pours His forgiveness into us in Holy Baptism, and places His forgiveness into our ears through Holy Absolution and preaching, and even places His forgiveness into our mouths in the Holy Supper. Trinity would like to thank the sixty-nine people who came out on a wet afternoon to help her celebrate her sixty years of receiving Christ’s gifts and for helping her raise funds for seminary’s fall symposium, “ ‘You Then, My Son’: Pastoral Perspectives on Paul”. $527.30 was given in support of the seminary ($1,027.30 with the FaithLife matching grant). Thanks be to God!